I found this spot using google earth recently. Its about 20 minutes from my house, located in a neighborhood in garland. It is a pretty unique pond. very blue water, pretty good clarity. The pond seems to be rather deep. It looks like a small limestone quarry that was allowed to fill in. They installed a fountain in the middle, I guess to keep the water circulating, because there is no flow in or out, as far as I can tell. I cought a a few sunfish, and this crappie. Intersting place I will be going back too. The Llano, the San Saba, the colorado and some private water on the weekend of May 1st. May 15-16 will see me and the better half down in the Austin area. I plan for us to visit to Comal, the Guadalupe and possibly Lady Bird Lake. A few weeks later on the 28-31st we will most likely be staying at a bed and breakfast on the Llano. As summer arrives we will also start to make some trips to the Paluxy, Bosque, Nolan and Brazos. This year is shaping up to be great. Just became one of your followers. I see you also became one of my followers, I thing you and I can learn something from our fishing trips using the fly rod. The sun perch you caught is one of the most colorful warm water fish out there. What did you catch the crappie on? I was using a yellow foam spider when I caught the crappie. They were hitting the surface, going after mesquitos. I generally do not take many white crappies from the surface, I usually have better luck with clouser minnows. The black crappie I caugth a couple weeks ago where all taken on a floating spider, north fork nymph combo. Which sunperch? Down in South Texas they call them all perch, or sunfish. Up in North East Texas we call everything Bream. I catch alot of really nice looking Lepomis megaloitis, which is the top picture on my blog, as well as L. auritus. I really enjoy scientific names ebcause there are so many different regional names for the various sunfish. your blog is nice, I am trying to browse through some of the older posts. I have never caught a crappie on the fly. What color clouser were you using? Did you use a sinking line or just attach a weight to your floating line? I don't like to fish a sinking line that much, but if I can catch crappie doing it I will give it a try. Here in Alabama everyone refers to Lepomis Megaloitis as the sun perch. I guess everyone to his own. On your next post can you post some pics of the different bugs you are using to catch the crappie and bream? I will do a post on the Muddler and black gnat nymph in a few days with some pics. Thanks for the compliment on my blog. I am glad I have your blog, because it is really difficult to find gill fishermen with blogs----all the blogs are either trout or bass. 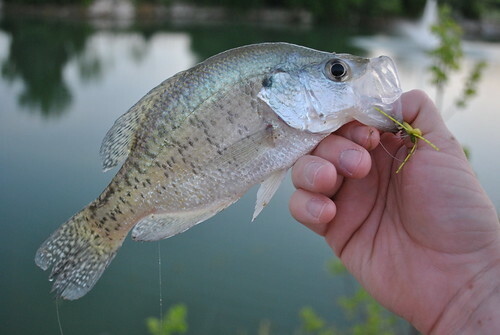 For the crappie I ws using the yellow foam spider pictured, if I was using a clouser (which I usually do) I tend to use white/grey, white/blue, green/brwn, red/brwn. That covers most of our baitish species in the South. I have a sinking line for rivers, or deeeeeeep water, but I rarely use it. If i want to get something down I use a heavy fly, i.e. bead head or tungsten nymph, and flourocarbon in sizes 1x-3x. Flourocarbon sinks faster than mono, smaller flouro sinks even fastr. I rarely use dry flies, if its surface its some type of popper, or foam spider. Here alot of people call megaloitis "cherry bream". I agree too many trout blogs lol!